Values. Trust. Communication. Commitment. Strategy. Leadership. These themes—articulated through hands-on exercises and the sharing of professional vignettes and expertise—were at the heart of a recent Rural Health Equity Track (RHET) workshop designed to prepare Department of Family Medicine and Community Health (DFMCH) residents for rural practice. Above, participants in a recent Rural Health Equity Track (RHET) workshop at UW Health Belleville Family Medicine. 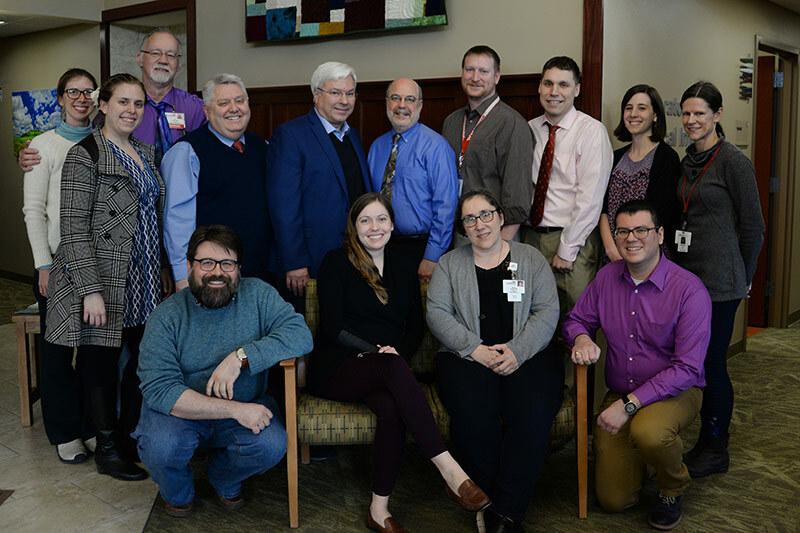 Back row, from left: Baraboo RTT residents Stacy Loerch, MD, and Kayce Spear, MD; Lou Sanner, MD, MSPH; Richard Roberts, MD, JD; Frank Byrne, MD, MMM, FACHE; William Schwab, MD; Baraboo RTT residents Mathew Herbst, MD, and Paul Stevens, MD; Jillian Landeck, MD; Jennifer Lochner, MD. Front row, from left: Baraboo RTT director Stuart Hannah, MD; Madison RHET residents Kelsey Schmidt, MD, and Karyn Cecele, MD; and residency program staff Justin Sena, MA. The workshop, led by Jillian Landeck, MD, and Lou Sanner, MD, MSPH, and held at UW Health Belleville Family Medicine, brought together Madison RHET and Baraboo Rural Training Track (RTT) residents, plus faculty experienced in both rural medicine and leadership. It kicked off with “Strengths for Leadership,” an exercise in which participants identify their own talents and learn ways to best use them in their work as individuals and team members. DFMCH Vice Chair for Education William Schwab, MD, then spoke about leading during times of change. He encouraged residents to make their leadership style one of observing, listening and asking first—and taking action second. Punctuating his thoughts with humor from Yogi Berra, he talked about how to anticipate reactions, recognize one’s own imperfections, be comfortable with financial issues, appreciate surprises and sustain change. “Fifty percent of baseball is 90 percent mental,” he said, quoting Berra, adding that a commitment to one’s core essence is the key to staying in the leadership game. Frank Byrne, MD, MMM, FACHE, president emeritus of SSM Health St. Mary’s Hospital, and a longtime DFMCH colleague, followed with reflections on conflict resolution and team building from over two decades’ experience as a health care executive. Good leaders build trust through honest communication and ground their decisions in what is right for patients, he said. He noted that the most successful ones possess “realistic optimism,” emphasizing that education is a must for clinicians transitioning into leadership roles. DFMCH Professor Richard Roberts, MD, JD, led the final session on leadership at different levels—a fitting topic for someone who has led community health improvement projects in Belleville, served on dozens of national boards and guidelines panels, and consulted in over 50 countries through World Health Organization delegations and as past president of the World Organization of Family Doctors (Wonca). Drawing on experiences from local committee meetings all the way up to international encounters, Dr. Roberts offered strategies that leaders can use to build attention, meaning and trust; understand underlying cultural pressures and create change. This workshop was the third of nine designed to teach residents to “think globally and act rurally” in their current training and their future practice. In previous workshops, residents met with rural Wisconsin medical leaders and strengthened their networking skills, and learned about the primary-care providers’ role in rural mental health care, including telehealth. The workshops are part of the DFMCH’s new Rural Health Equity Track, which launched at the Belleville Clinic in 2017 with support from a grant from the Wisconsin Department of Health Services.